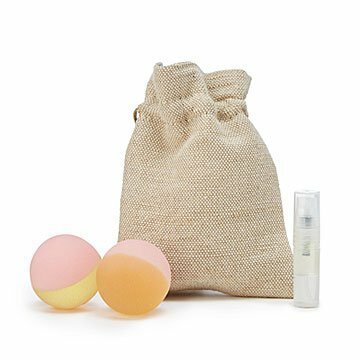 Mimic the bliss of a deep tissue massage anywhere with these essential oil-infused aromatherapy balls. You're in the middle of a relaxing massage when ahhh, there's an elbow on a pressure point. It should feel awkward, but it's a-mazing. These brilliant little balls let you mimic those heavenly moments at home. Created by massage therapist Stephanie Whittier, they not only let you give yourself a deep tissue rub down, they're also infused with essential oils for an aromatherapy punch. The larger mint balls apply greater pressure to extra-tense areas, while the smaller peppermint and pink grapefruit versions lend a softer (but still stress-relieving) touch. You can even take these little muscle-helpers on the go with their included carrying case. Sounds like paradise contained in textured proprietary rubber, right? Pop 'em in the freezer or place them in hot water for next-level tension relief and now we're talkin' bliss. (Peppermint and pink grapefruit also comes with a backup dose of essential oil in a handy spray bottle.) Made in New York City. Stephanie Whittier’s been practicing massage and craniosacral therapies for more than 25 years, providing her healing services to athletes, dancers, pregnant women, marathon runners, and cancer patients seeking alternative care and natural pain relief. She’s even treated a few celebrities in her hands-on practice. Stephanie’s years of experience, extensive education, and deep knowledge of multicultural massage techniques—along with her own need to self-soothe when she traveled for work—led her to develop a line of massage accessories and oils. Her breakthrough patent-pending process and products deliver holistic healing benefits in user-friendly, portable packaging. She lives in New York City, where her bath and body oils are blended by hand. Rinse with cool or warm water, air or pat dry then refresh with matching aroma refresher spray as needed.Do not use soap, rubbing alcohol, or antibacterial gels as this will damage the proprietary, textured rubber compound.